Welcome to the February 15, 2017 edition of ACM TechNews, providing timely information for IT professionals three times a week. Researchers at the Center for Quantum Technologies (CQT) in Singapore have found quantum "replicants" of responsive systems can be more efficient than classical models. The team explored input-output processes, evaluating the mathematical framework for describing arbitrary devices that make future decisions based on environmental stimuli. Classical devices were found to be less efficient than quantum responsive-system replicants because they must store more past information than is required to simulate the future. Nanyang Technological University professor Mile Gu says physics only dictates the likelihood a quantum system implodes to each possible value once a measurement is executed, which boosts the system's efficiency. "By engineering a quantum device so that different inputs are like different quantum measurements, we can replicate the same behavior [of a classical device] without retaining a complete description of how to respond to each individual question," says CQT's Jayne Thompson. Researchers at the University of Alberta (UAlberta) in Canada have patterned and imaged silicon at the atomic scale, which they say is an achievement that has revolutionary implications for quantum and classical computing. UAlberta scientists Robert Wolkow and Taleana Huff employed atomic force microscopy for atomic-scale fabrication and silicon surface visualization for the first time. The team has largely surmounted the challenge of risking disturbance of the surface to build circuits by manipulating single atoms. Wolkow cites the participation of Compute Canada as vital to the research, with its contribution of a new computational strategy that analyzes and confirms the identity of the imaged atoms and electronic bonds. He envisions the research eventually leading to the production of silicon circuits that potentially use only a thousandth of the power consumed by existing devices. Researchers at ETH Zurich in Switzerland say they have refined machine learning by deliberately misleading intelligent machines, enabling a new form of computerized data categorization. The method pioneered by ETH Zurich professor Sebastian Huber not only permits categorization of any data, but also notes whether complex datasets contain categories at all. The researchers applied the technique to a many-body system of interacting magnetic dipoles that never attains equilibrium. 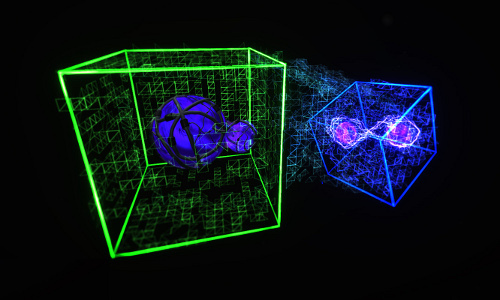 To pinpoint the boundary between systems that reach equilibrium and those that do not, the team took data from quantum systems to set up an arbitrary boundary, and then misled a neural network into thinking one group of data obtained equilibrium while the other did not. The researchers demonstrated this data-sorting performance relies on the location of the boundary, and they determined the boundary's location based on the network's highest sorting performance. Researchers led by Leo Gross at IBM Research say they have created a triangular molecule whose production has evaded conventional chemistry, suggesting such a molecule could power quantum computers. The triangulene molecule features carbon atoms bonded to a hydrogen atom, with two free electrons. Gross' team used a specially built machine that images molecules at the atomic level to construct triangulene. They obtained a triangulene precursor from chemists at the University of Warwick in the U.K., and removed the precursor's two extra hydrogen atoms with voltage pulses, leaving two free electrons remaining. The researchers then verified that both free electrons had identical spins, which can be manipulated. They say the molecule was able to maintain its stability for up to four days. The researchers believe the application of such molecules to quantum computers is a possibility. Researchers at Stellenbosch University in South Africa collaborated on software that helps researchers collect and manage data on great white sharks spotted along the coast. Marine biologist Sara Andreotti previously built a database containing more than 5,000 images of the dorsal fins of sharks. The new image-recognition software, Identifin, uses the dynamic time-warping algorithm technique to find similarities in dorsal fin shapes. 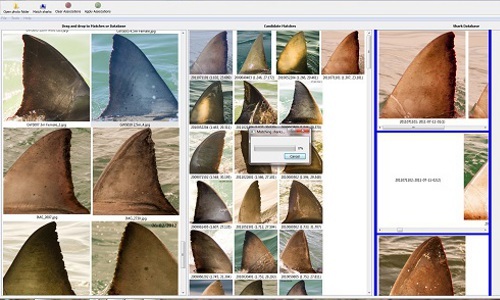 Identifin traces the patterns on the edge of the fin and compares them with existing images in the database, then arranges and ranks images to show the most probable matches. "The software had to be capable of quickly matching the fin identification of a newly photographed shark with a possible existing match in the database, and to automatically update the sharks' ID catalog," Andreotti notes. The lack of standardization of data collection has been a major challenge for marine biologists seeking to combine global datasets. The recent Women in Data Science Conference in Cambridge, MA, provided a forum for female data scientists to discuss a range of topics in the field, including gender imbalances and data science's role in artificial intelligence, healthcare, and renewable energy. The conference was hosted by Microsoft, Harvard University's Institute of Applied Computational Science, and the Massachusetts Institute of Technology's Institute for Data, Systems, and Society. Symposium speakers discussed the necessity of using machine learning to handle rapidly growing volumes of data, which has been challenging for smaller technology firms due to tensions between researchers and engineers. 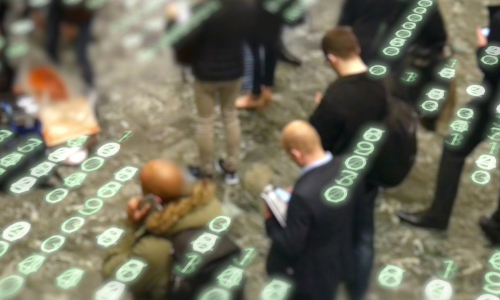 iRobot's Angela Bassa says diverse teams that explain algorithmic models to people without data science backgrounds can drive a project's commercial success. "To get a better solution at the end you want to enable innovation that allows engineers to build something...in a way that fosters the curiosity and the academic pursuit that will be part of your insight engine," she notes. Researchers at the Massachusetts Institute of Technology (MIT) say they have built a low-power speech-recognition chip capable of achieving power savings of between 90 percent and 99 percent over existing technologies. Although a smartphone running speech-recognition software may require 1 watt of power, the chip needs between 0.2 milliwatts and 10 milliwatts. Instead of running a neural network continuously to detect every sound and noise, the device features a "voice activity detection" circuit that distinguishes ambient noise from speech, activating the on-board speech-recognition circuit only when speech is heard. A voice-recognition network is too big to fit in a chip's on-board memory, but going off-chip for data is energy-intensive, notes MIT professor Anantha Chandrakasan. The MIT design minimizes the amount of data the chip retrieves from off-chip memory by compressing the data and passing larger increments of the audio signal through each node of the neural network. Dona Ana Community College (DACC) and Virgin Galactic have launched a collaborative education and outreach project to explore the newest technologies and possibilities of virtual reality (VR) in research, education, business, and career technical education. The program will start with a VR simulation that explains core concepts of aerospace fundamentals and gives students an immersive virtual spaceflight experience. The program could be used to let prospective homeowners walk through a designed space and make comments, help doctors to practice dissection skills, enable tourists to walk through historical and cultural sites, and provide scientists with an opportunity to see and predict how an experimental drug will react. DACC's Matt Byrnes says the collaboration between the private and public sectors and between technology companies and the creative media arts is essential for building "a larger toolset to positively impact not only aerospace but healthcare, agricultural technology, and other industries growing in our community." Researchers at Argonne National Laboratory have created a theoretical map to use ferroelectric material to process information using multivalued logic, a major breakthrough that could enable computing systems to process information much more efficiently. Although conventional computers use the binary writing system of ones and zeroes, if computer language could be expanded to three or more values, the same physical switch could encode much more information. "Most importantly, this novel logic unit will enable information processing using not only 'yes' and 'no,' but also 'either yes or no' or 'maybe' operations," says Argonne researcher Valerii Vinokur. This type of computing, known as multivalued logic, is possible because ferroelectrics' polarization can be controlled with electric fields. The researchers found films of perovskite, a ferroelectric material, could hold up to four polarization positions that are energetically stable. Researchers at Lehigh University and Washington University in St. Louis say they have developed the first cross-browser fingerprinting technique using machine-level features to identify users. The technique takes advantage of many new operating system and hardware features, especially those involving computer graphics, in both single- and cross-browser fingerprinting. The researchers say their approach accurately fingerprints 99.24 percent of users, compared with 90.84 percent for the current state-of-the-art technology, while using the same dataset for single-browser fingerprinting. In addition, they say the new technique can achieve higher uniqueness rates than only the cross-browser approach with similar stability. In addition, the new approach is highly reliable, as the removal of any single feature decreases accuracy by at most 0.3 percent. The team collected data via crowdsourcing, asking participants to visit their site with two different browsers and encouraging them to use a third browser. Researchers at the University of Luxembourg's Interdisciplinary Center for Security, Reliability, and Trust (SnT) say they have developed "Equihash," an algorithm that functions as a core element of the new Zcash cryptocurrency. Equihash is designed to alleviate several problems inherent in bitcoin, including its lack of privacy for transactions and its reliance on special supercomputers for transaction verification. Luxembourg professor Alex Biryukov and SnT's Dmitry Khovratovich say Equihash solves the latter problem because it cannot be segmented into smaller working packages, enabling efficient calculation on multicore desktop computers. "Since Equihash is based on a fundamental computer science problem, advances in Equihash mining algorithms will benefit computer science in general," Biryukov says. "Equihash is...memory-hard on the one hand and very easy to verify on the other." Zcash's creators opted to use Equihash as the algorithm for mining coins and verifying transfers. 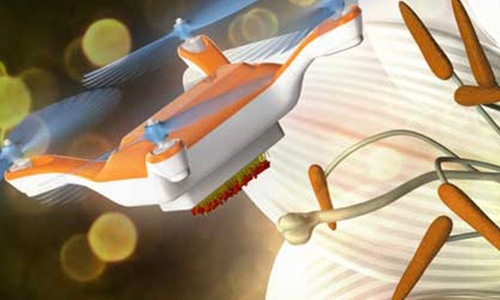 Researchers at the National Institute of Advanced Industrial Science and Technology in Japan have created a drone that transports pollen between flowers. The manually controlled drone, based on the principle of cross-pollination in bees, is four centimeters wide and weighs 15 grams. The bottom of the drone is covered in horsehair coated in a special sticky gel. When the drone flies onto a flower, pollen grains stick to the gel, and then rub off on the next flower the drone lands on. In testing, the drone was able to cross-pollinate Japanese lilies, and the researchers found the flexible animal hairs did not damage the stamens or pistils when the drone landed on the flowers. The researchers currently are working on developing autonomous drones that could help farmers pollinate their crops. The drones will be equipped with global-positioning systems, high-resolution cameras, and artificial intelligence to independently track their way between flowers and land on them correctly.